My friend Lexi (who just had a baby...congrats!) told me about this baby bottle sling and it is amazing. You just strap it to your car seat and it holds the bottle in their mouth. It took her a couple of days to learn how to use it...but I love it. I definitely wouldn't recommend it for your first baby since you have time to hold and love and snuggle your baby, but with number two when you need about five extra hands, this comes in very handy! I try to feed her myself as much as I can, but any mom of two + will know their are times when you just need to prop a bottle and this is an excellent alternative! The website is just bottlesling.com $20.00 for moments of sanity, well worth it. 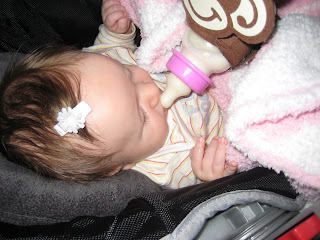 Plus the awesome thing about it is that it stimulates early development in holding their own bottle. You can see her trying to in these pictures. YAY! I finally got to your blog - I couldn't get the URL to work last week for some reason! These photos are so cute - that milkie thing is awesome. What a great idea! The photos from the blessing are beautiful! I feel so bad that we missed it - we both really wanted to be there. Give both of your girls a big hug from us! We need to hang out soon!! Love you guys! Wow, that bottle holder is cool! Those blessing pictures of Sophie are TO DIE FOR. She is so darling.